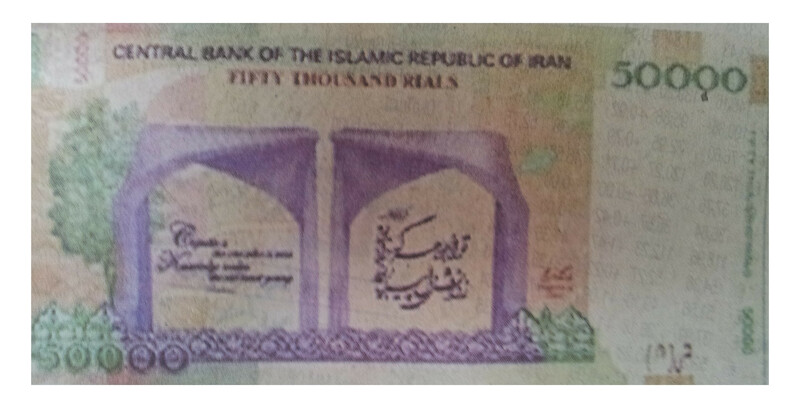 RIght in time with the agreement between Iran and five permanent UN security council member states and Germany about the limitations of IRIs nuclear activity and the lift of the economic sanctions, the Iranian national bank has issued a new banknote of 50.000 rial. Whereas the old one from 2007, designed under the command of the late IRI president Ahmadenijad, displayed proudly the ambitions of the country to become a nuclear superpower, its 2015 replacement version shows a more neutral architectural detail of the Tehran University. The script next to it cites the prophet Mohammed with the words “The Persians will reach every knowledge, be it here on earth or later in heaven”. The phrase might sound cynical, since it threatens that if they won’t surrender under the muslim conquest, they would be eliminated. 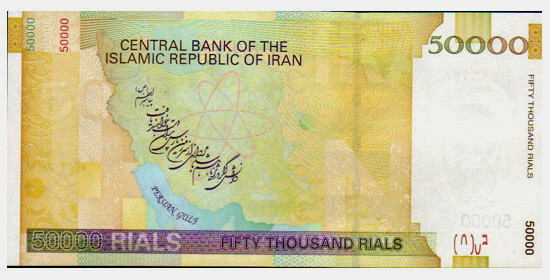 On the new banknote, together with the ambiguous atomic symbol also this phrase by Mohammed was removed together with another detail: the naming of the Persian Gulf. Instead of Mohammeds words it is now the classical Persian writer Firdawsi, creator of the Shahnameh who gained the honor of reminding the customers who carry this banknote in their pockets of the great era of science, arts and philosophy that flourished in their country more than a 1000 years ago. A green tree left of the university gates can also be seen as a political symbol, since there is a lot of concern among the Iranians about the neglectance of any environmental protection in the country.